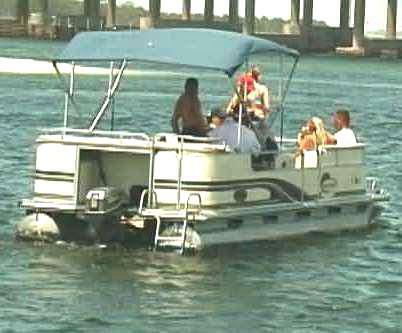 Destin Pontoon Boats, Try A Party Boat Rental On Your Vacation. Pontoon boat rentals are very popular with area visitors. You can use your boat to fish, snorkel, swin, and sightsee. Party boats can be rented from the boat rental operators below. There are a lot of really neat things you can do here, more than most people have vacation for. Click the buttons below to explore other soft adventures your family will enjoy. All of these activities have been popular with area visitors for years. Boating is a popular pastime for the local residents and visitors alike. Pontoon boats are a popular rental with area visitors. Two or three families can go together, and enjoy a day on the water at a modest price. Links to boat rental operators can be found at the buttons to the left of the photo.